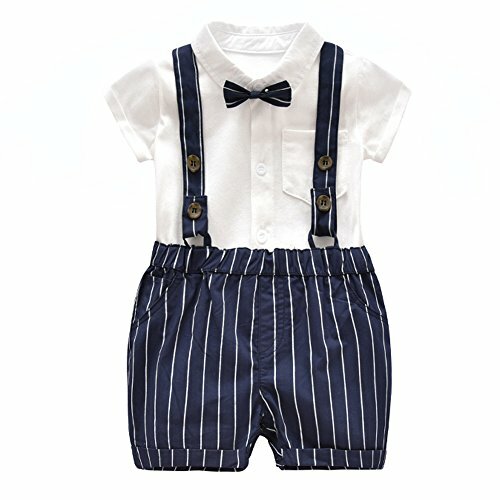 It is baby boy summer cute sets, cotton triangle short sleeve white bowtie romper+striped suspenders shorts, cotton fabric.5 size are available for choosing£º3-6M,6-9M,9-12M,12-18M,18-24M. The romper and the susoenders shorts can be separable. Suitable for summer wearing .Hand washing preferred. Cute design, never out of fashion. If you have any problem ,please just feel free to contact us . Perfect for summer wearing, make your baby cute, suitable for wedding, party, birthday and so on. If you have any questions about this product by Ding Dong, contact us by completing and submitting the form below. If you are looking for a specif part number, please include it with your message.